From Roger C. Schank—one of the most highly respected thinkers, writers, and speakers in the training, learning, and e-learning community—comes a compelling book of essays that explore the myriad issues related to challenges faced by today’s instructional designers and trainers. The essays offer a much-needed perspective on what trainers do, why they do it, and how they do it. 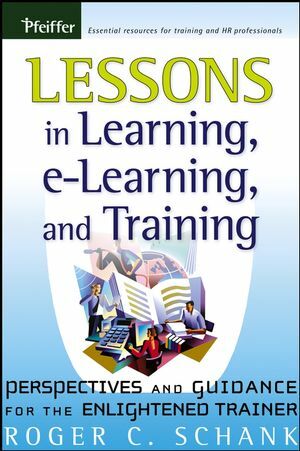 Lessons in Learning, e-Learning, and Training serves as a barometer to the issues that often perplex trainers and helps to illuminate three main points: what can and cannot be taught; how people think and learn; and what technology can really effectively provide. In addition, each essay is filled with practical guidance and includes a summary of ideas, tips and techniques, things to think about, checklists, and other job aids. Roger Schank—one of the world's leading researchers in artificial intelligence and applying cognitive learning theory to education—founded Socratic Arts, a company dedicated to helping schools and companies build meaningful curricula online. A prolific writer, Schank is the author of twenty-five books and in 2000 was recognized by ASTD for his "distinguished contributions to workplace learning." 1. I Told You Not to Tell Me That. The case for not “telling” in training—and some guidelines for doing it if you must. 2. I Wanted to Learn But There Was No Money in It. Thoughts on the relationship between learning goals and rewards—and how to design training that helps learners stay motivated. 3. Teaching What Can’t Be Taught. The value of knowing what you cannot fix—and understanding how people really change and what the culture has to do with it. The reasons most e-learning is so bad (and other training, for that matter)—and five questions to ask to begin to make it better. 5. Enron Fixes Their Communication Problems. Thoughts on when to just say no—like when your company asks for a training course. The role of nonconscious learning—and how to help adults do it. 7. I Can’t Remember Whether I Ate the Whole Thing. On the difference between event memory and procedural memory—and how practice has to figure in. 8. Sir, Step Away from the Fig Newton. How what happens in real life undoes training—and what to do about it. Storytelling insights—and how hearing, telling, and living stories makes for good training. The excuses for not doing doing-based training—and how to avoid them. 11. Pardon Me, I Must Have Misplaced My Stereotype. The pros and cons of stereotyping—and how to teach people to do it well. 12. Every Curriculum Tells a Story (Don’t It?). The problems with most curricula today—and how they inspire a different way to define the training designer’s job. 13. And We’ll Have Fun, Fun, Fun ‘til Our Company Takes the e-Learning Away. Why most e-learning is boring, not fun—and real-world tips for making it more engaging. 14. I Disagree with the Question. The importance of getting the questions right—so the rest of your job is easy. Why most e-learning you are likely to encounter isn’t very good—and how to recognize it. How AI might help when you have a problem that you need a smart computer to do—like building story-based training systems.